I decided to try my hand at this weeks Waltzing Mouse Sketch Challenge. I like how the card came out, however, I have heard so much about Glimmer Mist so I picked some up today. When I sprayed it on the card it left droplet marks on the paper and smeared the ink on my sentiment. I used Cloud 9 pattern paper and Recollections card stock. Using some of the fun little elements that come with Waltzing Mouse Stamps, I made my own pattern for the ornaments (except the text one, I used an Inkadoo stamp). 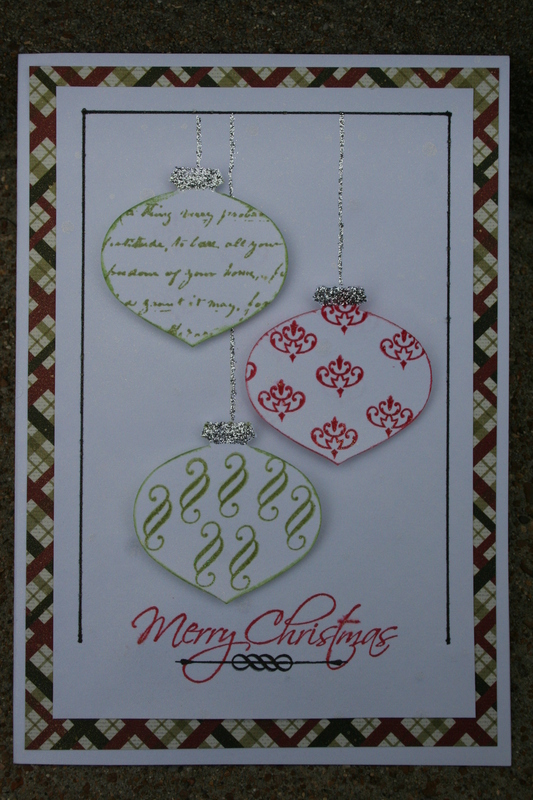 I stamped it with Pear Pizzaz and Rose Red inks, then embossed it using Sparkle powder. 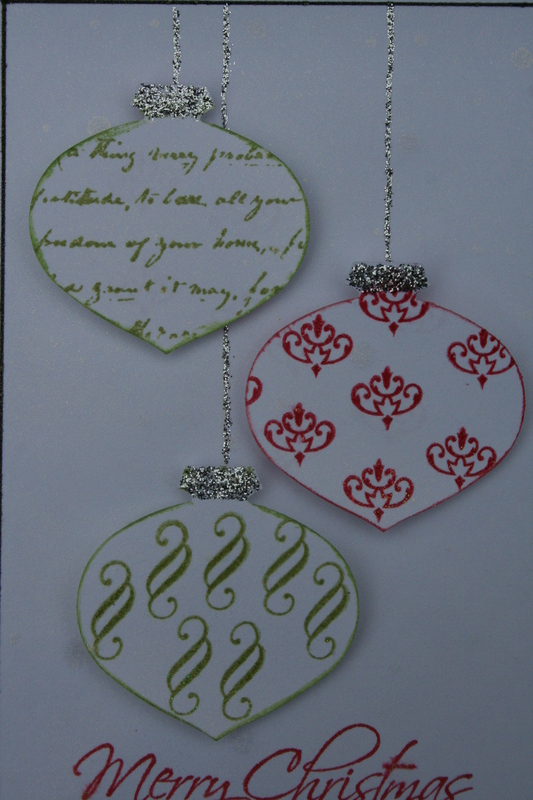 The Stampin Up ornament punch gave the great shape. Then I used silver Stickles to define the tops. After cutting my paper I hand drew a rectangle reminiscent of the new Frame it stamp set from Waltzing Mouse, using a black marker. Then I stamped the Stampabilities sentiment at the bottom and underlined it with another Waltzing Mouse stamp. Next, I figured out where I wanted the ornaments placed within the rectangle and made “ornament hangers” with the silver Stickles. Finally, I popped the ornaments up with dimensionals. And, as I mentioned above, sprayed the card with Glimmer Mist. Thanks for taking the time to have a look. Comments are always appreciated! I am a full-time sales representative, a full-time mom to two girls and a boy, and a wife to a terrific husband. I started scrapbooking/card making in the summer of 2009. That's when I got my cricut! The first card I made was for a little girls birthday party. I don't think she gave it a second look, but her mother did. I recieved a lot of compliments and my passion grew. I found some very helpful and inspirational blogs that helped me develop skills and creativity. so here I am trying to do the same for someone else.